WE BELIEVE in Academic excellence, and for Mrs. Kelsey Bertsch Grome that is a big focus in her classroom, for herself, and for her students; She pushes her students and herself to be the best they can be to move forward in and out of school. Mrs. Grome is a 2011 Newport Central Catholic graduate and graduated from Northern Kentucky University in 2015. Walking through the hallways you'll always see a smile on Mrs.Grome’s face. She is the definition of optimism and as an alumna she understands more than a few things as to what you need to know about our school. Out of high school, she already knew she wanted to be a teacher, so she went straight into the education department at NKU. “My dad is actually a teacher at Newport High School, and seeing how happy he was every morning going to his job made me want that same thing,” she said about her decision to become a teacher. First, she substitute taught at Newport Independent Schools and then earned a full time job teaching English at NCC last year. At NCC staying involved at after school activities is a huge part of the experience whether that is sports, participating in a club, signing up for new things, or simply just volunteering. As a student, Grome was involved in things like the play, choir, student government, students for life, and she was also class president… If that does not impress you, I don't know what will! As any student, she stressed over due dates, but she was always on time. She described herself as a nerd saying, “I would do anything a typical honors student would do.” Time management was a strength for Mrs. Grome. “I loved having structure and always having a schedule,” she said. All students should have such a thing in their educational experience and NCC stresses that. She carried these qualities from high school into her own classroom. “When you walk in I have expectations for you, and I want you to have expectations for yourself, as well,” she said as she did for herself as a student. Grome’s favorite part about her job is the students. “High school kids are resilient,” she says with a laugh referring to the fact that her students can recover quickly from a joke or two. 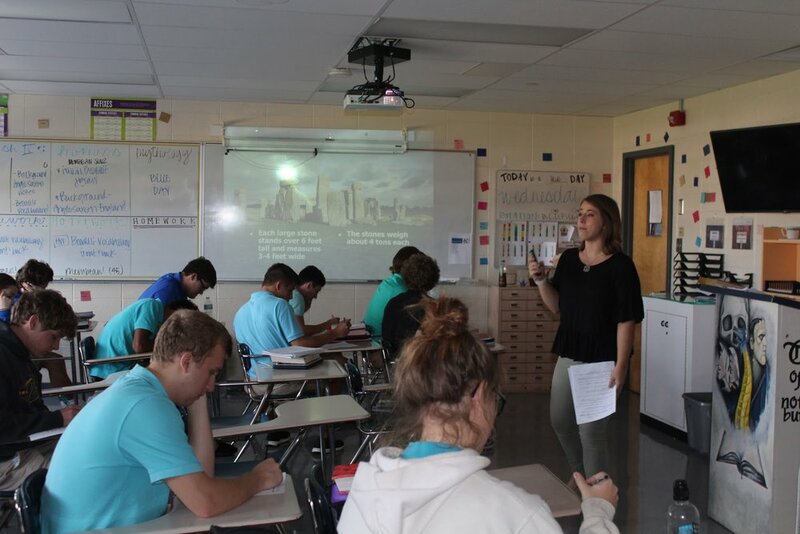 As a student, if a teacher is willing to use good humor to connect with them it can establish a fun and effective learning environment, and Mrs. Grome caught onto this theory. Students all have those subjects they do not like, but Mrs. Grome always has a way of making things not seem so bad. Anyone who has had her in the past would most likely agree. She is animated in a special way, full of life and excitement. While reading books or Shakespeare plays, she reads them in a way where one can really imagine the characters and the setting. She captures and keeps attention with her upbeat personality and readings which is especially beneficial for students that have a hard time focusing. Mrs. Grome always passes a little positivity here and there in the classroom, but she also has a little wisdom to share. She had to think about this one for a little bit, but once it came to her, she hit it spot on. “As we all know, high school is the fastest four years of your life!” she said. “Some students don't realize how important your academic career is compared to your private life. I did not try to the best of my ability in school, because I thought I was never going to be number one so I did not sign up for scholarships.” This is something that current students can surely relate to, but opportunities are out there. “DO NOT be afraid to ask questions,” she continued as her eyes got bigger, “You never know how much of a dramatic difference it makes.” Giving one last piece of advice, she said, “Everything seems like a big deal in high school, which it is but when college comes you'll realize it doesn't matter that much and you'll regret not trying harder.” She impacts all her students with her lightheartedness, experience and wisdom. All of NCC would agree that we are very lucky to have had Mrs. Grome as an excellent student and now an even better teacher! Alum, Mrs. Kelsey Bertsch Grome. '11 teaches English at NCC. Carrigan Matteoli is a junior at Newport Central Catholic. She plays soccer and is hoping to run track this year. Some of her favorite subjects are poetry, Biology, and journalism. Carrigan is involved in things like Breds for Life and wants to continue to get more involved as the year moves forward.